Tube complement: 12B7 RF amplifier, 12SA7 mixer/oscillator, 12B7 IF amplifier, 12SQ7 detector, 35L6GT audio output, 35Z5GT rectifier. Approximately 15-3/8 inches / 39 cm wide. Those white things behind the knobs are an additional pair of controls. 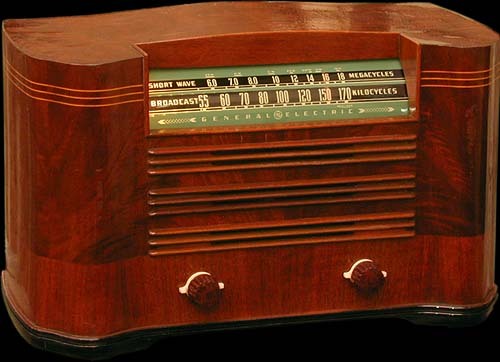 One is a two-position tone switch, the other an AM/shortwave band selector. They're brown, not white, on some examples of this model I've seen. 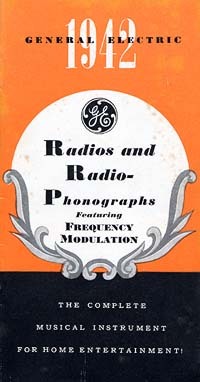 At left, the front cover of the 1942 G-E radio brochure. Above, the brochure's section on the model L-633.